We enjoy a variety fruit and smoothie products at our house. One way I can guarantee that my sons get enough fruit in their diet, and that we have a good option for on the go, is to give them one of the commercially-packaged products that kids can squeeze out of a pouch. These have always been a favorite way to eat with our family, and it's a mess-free option for in between meals, as well! If the thought of paying for -- and throwing away -- those pouches bother you, there's a new product option available that can ease your guilt and keep you from paying for something you'll throw away. 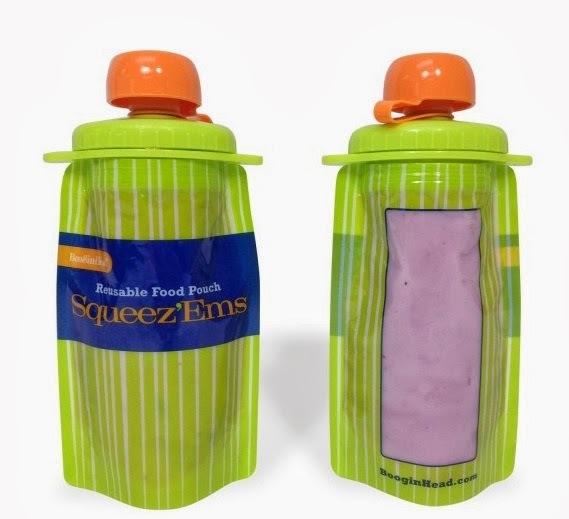 Squeeze'ems Reusable Food Pouches work with any "squeezable" food: applesauce, blended baby foods, pudding, etc. Fill them and store them in the fridge for when you're ready for a spill-free snack (no spoons needed, either.) When your child has eaten, save the pouch, wash and reuse for later. And for the parent who seems to NEVER be able to find the little pieces to sippy cups, bottles, etc, you'll be happy to know that Squeeze'ems are ONE piece -- even the lid is attached. Just screw them on and off and rest easy you'll be able to find them when you need them. Learn more about these simple solutions on their Facebook page, Twitter account, Pinterest Boards, and website. *Sample pouches received to review. Opinions are 100% my own.